It is the high time many tourist booking us package tour to Northern Viet Nam just for taking photo of golden terraced rice fields here. It just about 250 kilometres from Hanoi and so most of people prefer motocycle coming here. The journey to the northern mountainous province of Yen Bai is to explore boundless golden terraced rice fields, resembling a staircase to the sky, in Mu Cang Chai district which used to be an opium poppy hub. The yellow steps to the sky, and the hospitable ethnic people, who have flattened hills to grow rice and construct irrigation systems on the mountain tops, are unforgettable images. The first stop in Yen Bai is Tu Le town, Van Chan district, Tu Le's beauty is shown through lonely fields on mountain sides, small wooden houses appearing vaguely at different heights, boundless fields surrounded by the three mountains of Khau Pha, Khau Song and Khau Tan, and calm big springs. The Hai Ba Chau (Grandmother and granddaughter) peak is an ideal place to enjoy the overview of Tu Le. One of Tu Le's specialties is sticky rice served with grilled local pork. Unripe rice is favoured because of its sweet fragrance and mild glutinousness, unique characteristics of Tu Le sticky rice. In Tu Le, we were surprised not only by the landscape and special food but also by local people. Thai ethnic people in the town bath in natural hot springs. In the afternoon, normally from 5pm, they come to the hot water pool next to the Nam Cuom spring, taking off their clothes and enjoying the hot water and natural surroundings. 24-year-old Lo Thi Hoa and her nine-month-old son are bathing. "Thai children are familiar with nature from an early age. I want to teach him how to live in harmony with nature because we live a natural life and nature acts as our and great mother," she said. it resembles a water-colour painting because the grey fog halos the town. 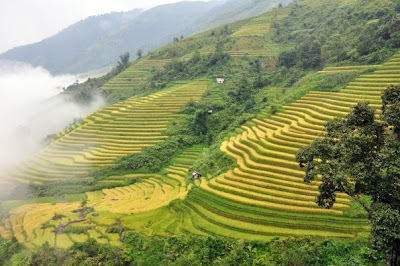 Terraced fields can be seen everywhere in Vietnam's northern region, and the most beautiful ones are in Mu Cang Chai. According to the local language, Mu, originating from Mo, means wood, Cang means dry and Chai means a piece of land. Hence, Mu Cang Chai is the land of dry wood. From March to June, hot and dry westerly winds dominate the district, which is considered one of poorest areas in the country. More than a decade ago, Mu Cang Chai was a poppy-growing area with its La Pan Tan commune growing 300 hectares of poppy, or one-tenth of the commune's total land area. Before 1991, poppies were planted everywhere. Every household planted them. The smell of opium haunted local people all the time. "Now, even in the farthest villages such as La Pan Tan and Ze Xu Phinh, there are no poppies," confirmed Hoang Xuan Tuyen at the Mu Cang Chai People's Committee. From mid-August to mid-September, the whole of Mu Cang Chai is dyed in yellow of ripe rice. The fragrance of ripe rice is pervasive in the air, even in the dresses of the H'mong and Thai girls. Sometimes, green young rice fields join yellow ones to create eye-catching forms looking like colourful patch-work dresses. 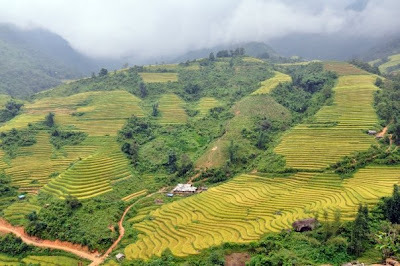 In August 2007, the Ministry of Culture, Sports and Tourism recognised the terraced fields in the three communes of La Pan Tan, Ze Xu Phinh and Che Cu Nha as national landscape sites. Vang A Pao, a local villager says: "I sometimes stare at high hills covered with and surrounded by immense yellow terrace fields. They're so beautiful that I'm afraid when harvesting rice, I will destroy the beauty." The beauty is not only created by nature but also by locals, especially H'mong ethnic people whose hands are often rough and hard, vestiges of years of working in paddy rice fields. Mu Cang Chai, part of the Hoang Lien Son volcanic mountain range, teems with high mountains, hard-to-access terrain, and harsh weather conditions. To ensure stable food supplies, locals have flattened mountains and hills to grow rice. When looking at beautiful terrace fields, many visitors ask the same question "How can people water their fields? Locals use a system of troughs to take water from springs to the tops of mountains. From the peaks, water flows spirally down to fields. Keeping water in the fields is major construction achievement. They make beds of fields surprisingly flat to ensure that every rice plant has the same level of water. In Mu Cang Chai, terrace fields are beautiful all the year round, no matter the season. If visiting them in March, you will be bewildered by glittering fields. From April to May is the time locals transplant rice seedlings. After that, all hills will be covered by everlasting green. Rice fields start to turn yellow from late August. People in Mu Cang Chai grow only one crop annually. After harvesting rice, they let the land lie fallow. They think that the land is like people, and it needs time to relax. In the between-crop period, they hold festivals; make new clothes and pound corn. The new rice festival of H'mong people is to honour the sky, the earth and gods who create favourable conditions for people to have bumper crops. Locals gather at communal houses to share new rice and new alcohol, and cook delicious local dishes. Plenty of sweet rice and alcohol is the result of a hardworking year.